Arguably an equally stupid decision in K-Pop was letting them go in the first place, but bringing them back with the forgettable and uncharacteristically low-key Be The Light made hip hop group Block B’s transition back into the world of K-Pop much too soft for them (though it featured some IMPRESSIVE vocals). When the world found out in early 2013 that the group was being discontinued thanks to shifty business from their label, Stardom Entertainment, there was a universal ‘boooooooooo’. We were all forced to move on and leave Block B’s solid effort and hard work as a mere memory. So, when news broke that they were to return under a new label, much glee existed! Fan-girls rejoiced, the press held cameras at the ready and I was sitting at the very edge of my seat waiting to see what gold these guys would come up with next. Yet, somehow, when their first video broke, I did not have that ‘YES!’ feeling I’m used to getting from them. Why? Oh that’s right. It’s because their first song was a ballad. A BALLAD, I tell you. BLOCK B. BALLAD. 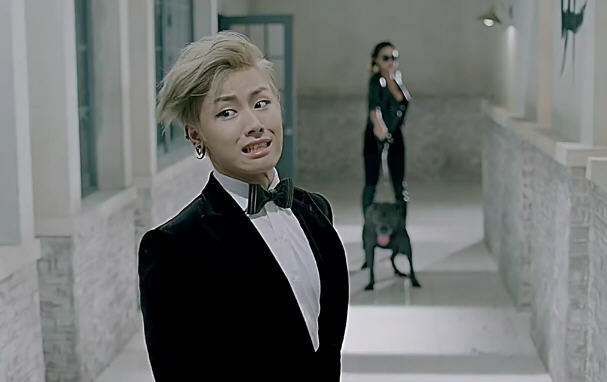 Not just that, but a ballad in which U-Kwon is beaten to a pulp and a random woman gets more screen time than Zico. Thankfully, soon after, the brilliant Very Good was released – which featured their standard fist pumping, crazy choreography, weird hairstyles, staple attitude and a CLASSIC Block B concept: robbing a bank in clown masks (dat opening). However, one is forced to ask, who gave the go-ahead for the ballad over this? From left to right: SHINee’s Taemin, SNSD’s Hyoyeon, Super Junior’s Eunhyuk and Henry, and EXO’s Kai and LuHan. SM, you literally had one job: Put six of K-Pop’s best dancers in a room together and watch the magic happen. 2012’s Hyundai promo track Maxstep featured some awesome choreography and some fan-pleasing face-time (let’s be honest though, any face-time in K-Pop is pleasing to the fans), but the dubstep-heavy song, the concept and the outfits were forgettable. A year on, we have seen nothing else from these guys. I am surprised, given A) SM’s desire for profit and B) the fact that it is a fan-girl’s dream to see members of different groups mashed together in a video. SM struck gold with this promo group, but their debut was built up far too much to justify disbanding them after one song. The brilliant mix of style, age, versatility and talent that Younique Unit demonstrated was over before we could all fully enjoy it. There was just so much skill in one group, and the dancing was genuine, without relying on ‘sexiness’ or cool camera techniques. A bit of advice, SM, if you’re going to put six of your most epic stars in a group together, spam the heck out of it. 4. Not making ‘Airplane’ a single. f(x) looking good as usual. As much as f(x) isn’t a favourite group of mine, last year’s Pink Tape certainly was a great album, so I can imagine that it would have been a hard choice picking a lead single for it. Rum Pum Pum Pum was a standard choice, because it allowed for some dancing (a skill which is certainly not scarce amongst the girls of f(x)), but it was all just very, ‘yeah yeah, another one of these’. I genuinely could not believe – when I heard the full album – that Airplane had been overlooked. Not just as a lead single, but as a single in general (Just to clarify, by single I mean it gets a music video). There is something so refreshing about the track… I can’t decide whether it’s Luna/Krystal’s OP voices, the echo-effect on the microphone, the randomly placed English words that somehow make complete sense with the music, or that brilliant kick in the chorus. Whatever it is, Airplane is nothing short of a brilliant track, and as cheesy as it sounds, I actually feel like I could be flying when I listen to it. They had time to take many photos in 2013, but apparently not enough time to make new music. I feel I do not need to say much about this. Although 4Minute’s Hyuna (the girl from the original Gangnam Style video) is a beautiful woman and a great dancer, the second version of Gangnam Style she made was transparently money-grabbing. There was no way it could have possibly matched the level of the original PSY viral video and the change in tune, lyrics and choreography was just a bad idea. A BAD IDEA. Cringe-worthy. Some are more cringeworthy than others. I’m sorry, but… three of the biggest and most talented groups in K-Pop – three of the lamest, most unjustifiable fan-club names in history. We know that there are English-speakers amongst the SM staff. We know that their lyrics – most of the time – make sense. So it’s almost as if they sat down and went, “Right. Most of our fan-base are 14-year-old girls who believe they are going to one day be SNSD or one day marry the boys from Suju and SHINee. Let’s, as a joke, come up with the most ridiculous names possible for our fan-clubs and see if they start identifying themselves by them.” And bam. Suddenly teenage girls everywhere started fighting with their friends over who was the bigger ‘Shawol’. Young boys started identifying themselves as ‘Sones’, and tweens everywhere started breaking the news to their parents: “Mom, I’m an ELF.” (I don’t think they realise how ridiculous it all sounds.) I just feel like they could have taken even just a little more time to try and think of some better names. Especially when they have to compete with other awesome fan-club names such as ‘Blackjack’, ‘VIP’ and ‘A+’ (Imagine being an Asian student and telling your parents that you’re an A+). And we know that SM is capable, because of TVXQ’s fan-club name ‘Cassiopeia’, which sounds like some epic planet in a galaxy far away, on which everything is made of gold. Look, at the end of the day, we know that K-Pop is Korean, so we’re not really going to come across any brilliant pieces of English literature in it. But, if you’re trying to eventually appeal to the West, you’re going to need to broaden your vocabulary a little (*cough* B.A.P *cough*). Hyoyeon’s beautiful close up in All My Love Is For You. Kicking the list off is one of my favourite stars in K-Pop: Hyoyeon Kim. In general, she is just a really talented young woman. However, given how aesthetics-based the industry is, and how ‘plain’ Hyoyeon was considered to be during the earlier stages of her career, it is no surprise that she has endured her share of plastic surgery to obtain the right ‘look’ for SNSD. It was such a shame to see her face go through so many changes (to the point where she was unrecognisable in childhood photos) and I wondered when it would stop. Thankfully, in late 2011, SM stylists struck gold with their promotion of The Boys. They died her hair blonde. It was so simple. So simple and so obvious. Why had they not tried it before?! Nevertheless, something changed that day. A new image was born; an image which she ROCKED. And still rocks to this day! Check her smashin’ the D-floor in Maxstep (still my favourite of her work – see number 5 above). I couldn’t resist this supremely 90’s boyband shot (The hair. The hair!) of the boys in their early days. Current members Changmin and Yunho are pictured on the right, aptly with a subtle gap between them and the others. I realise that this is not my first mention of TVXQ so far, but I think they deserve the credit. The boys went through one of the biggest public changes and controversies in K-Pop history in 2009, when after 28 hit singles together, three of their members left the group due to contract disagreements with SM Entertainment. They were forced to disband and Yunho and Changmin (the current members) were left alone and potentially unemployed. The issue for SM was: ‘Do we continue the group with only two members?’ Well, today, I thank them for saying ‘yes’. TVXQ became one of the most original and unique groups and had outrageous success for a group with two members. I cannot think of any other two-person group that even holds a candle to these guys. They owned everyone with their first single as a duo, Keep Your Head Down and have cranked out the dynamics since. The boys are talented in dancing and singing and have never failed to deliver good quality songs and dance routines (although this may have something to do with the fact that Yunho is a cut-throat leader but hey, it’s a tough business). I say this was definitely one of SM’s best decisions and I am glad that the chaps were given a chance to stand out. Good on ‘em! Taemin smashing Why So Serious live. Fan-girls everywhere cried when supremely talented vocalist Jonghyun Kim suffered facial injuries in a car accident in 2013, which meant that he was going to have to step out of SHINee for a bit. Actually, a lot of people didn’t even know this was the case until SHINee came back with their hit Why So Serious? We saw the title, we thought, ‘Hey! A Joker reference! This will be cool!’ And boy, was it ever. It was about ten seconds in when we realised that Jonghyun was not, in fact, rocking the first verse like he usually does. Instead, the youngest member (or ‘maknae’) – known previously for his amazing skill and precision in dancing (but really, nothing more) – conjured up the voice of an Asian Justin Bieber (when his songs were actual singing and not rapping), and SMASHED it. I actually remember the moment I heard him sing that first line (Taemin, not Justin Beiber). I believe I actually said ‘woah!’ out loud, which is rare for me, because my first time watching any video clip of SHINee’s is usually spent in silent wonderment. The boy has talent! Was he always great at singing? No! But SM must have been doing some secret under-cover training or somethin’ because the boy got GOOD. Like, really good. He was belting out high notes left right and centre I was a little like, ‘Who’s Jonghyun?’ He’s hax, and basically, SM has produced yet ANOTHER completely OP K-Pop star. Above: SHINee and below: Infinite, now label-mates. Anyone who knows me knows that dancing comes first for me. Show me a routine with complex moves and/or amazing synchronisation, and I am beyond happy. So it was only natural that I gravitated towards Infinite, a 7-member male group with arguably the best movement synchronisation in K-Pop at the moment (seriously, check out their dance practice for Before the Dawn). However, as good as their dancing is (they are all trained dancers, which is not common in large K-Pop groups), there was only so far that they could go under the small label Woollim Entertainment. I was still okay with it, because they were makin’ it rain good dances, but I always knew they deserved to be bigger. So, it was a good day for me when I found out this year that my favourite label, SM Entertainment, was going to be taking them on under their management. Not only that, but my favourite Infinite member, Woohyun Nam, was going to be collaborating to form a duo with one of my favourite SM members – KiBum Kim (or ‘Key’) from SHINee. Needless to say, I was super super keen to see what was going to come out of this decision. The first movement was Delicious by the newly formed duo ‘Toheart’, which definitely did not disappoint! So, even though it is still in early stages, I can’t wait to see what is going to come out of Infinite’s skill and precision paired with SM’s brilliant choreographers. 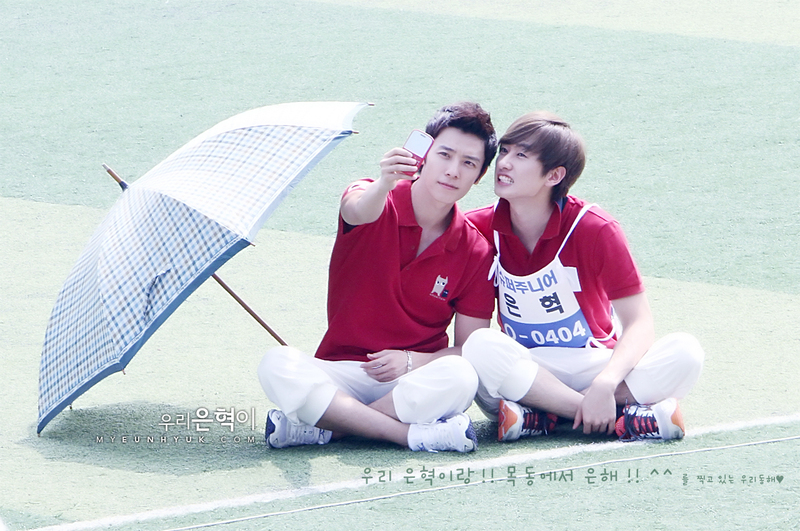 Donghae and Eunhyuk taking a selfie together. Fan-girls had fun with this one. Speaking of duos, how good are these guys?! Dong Hae Lee and Hyuk Jae Lee (or ‘Eunhyuk’) are two artists who originally started as part of the 13-member group Super Junior and who both have a trained background in dancing and singing. The boys were part of SM for several years before they were drafted into the sub-unit duo that would go on to create awesome party hits such as Oppa Oppa, I Wanna Dance, and Motorcycle. Since then, they have become the subject of millions of fan-girl crushes around the world. The boys are best friends IRL, which makes them the perfect target for ‘shipping’ (they themselves add fuel to the fire with all the selfies and Instagram videos they post of them together in numerous cute and/or BFF scenarios). Truly, their friendship and personalities make for an awesome duo, and through their concert videos, fan messages and Instagram/Twitter captions, it is evident that they have a massive love for their fans. In my opinion, they add credit massively to the SM name and they always manage to stay within the propriety and social boundaries of respectable stars, especially the ways in which they go above and beyond to acknowledge their fans. There will be a universal breaking of hearts the day the boys go into the army, but I will not be surprised, nor disappointed, in the slightest if they decide to do so side-by-side, as EunHae. Happy to be together. 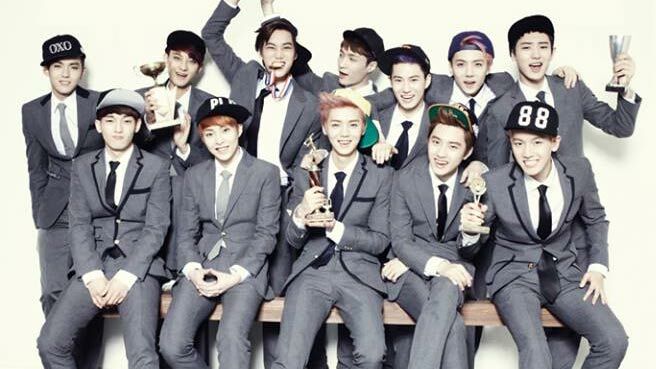 From left to right: Kris, Chen, Tao, Xiumin, Kai, LuHan, Lay, SuHo, D.O, SeHun, BaekHyun and ChanYeol. This poor group has been the guinea pig for ALL the new SM ideas. At first, SM spent thousands of dollars on their pre-debut teasers and the ‘concept’ for their first single in 2012. Next, they were cruelly split and sent to all the different provinces around Asia as their sub-units EXO-K (Korean) and EXO-M (Mandarin). Then, SM decided that it just wasn’t working and that for their comeback, they would confuse all the fans by bringing them back and putting them in all these confusing, non-language-specific combinations. I must say, within the space of two years, this was all a little much at first. Alas, when I saw their first combined clip for the single Wolf, I was amazed. There was something so awesome about seeing all 12 members together, and this might have actually had something to do with the fact that they had been split for so long. The single was incredibly well-received (well, the choreography was at least), got 26 million views on YouTube and quickly resulted in cover-groups around the world creating their own renditions. BUT, that success was small compared to the results their next hit, Growl, received. My goodness. When that single dropped, so did the jaws of teenage girls everywhere. 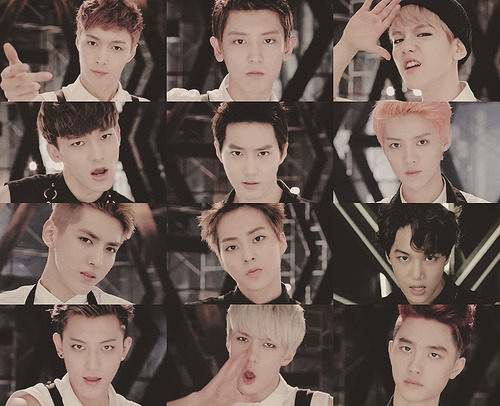 The concept for Growl was so awesome because it was so simple! The success of the clip relied solely on the vocal and dance talents of the boys (which they smashed) and the dynamics utilised by the 12-member factor were both impressive and creative. Growl went on to receive 32 million views on YouTube (not including the millions of views received by the Chinese version, their dance practice versions and their live versions) and easily became the most covered K-Pop dance around the world (check out our cover of it here). The decision to combine EXO turned every head in Korea and their success has broken records because of it. I have to say, building them up apart for so long and then bringing them back together was one of the best decisions SM ever made (Yes, I know that their upcoming release features them split again, but I’d argue that works better now because we’ve already seen them as one glorious whole). A young Ji Yong patting a dog. 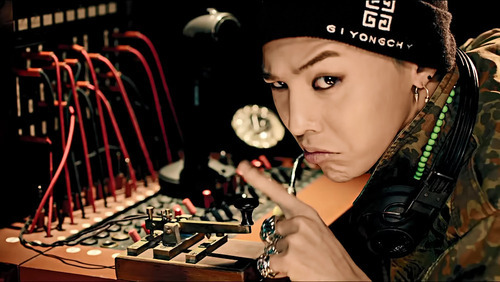 A screen shot from his video Crayon of 24-year-old Ji Yong shushing us whilst he makes music. Yes, yes, you may think that this is the inner fan-girl in me talking, but I genuinely believe that without G-Dragon, K-Pop would not be what it is today. Ji Yong Kwon is – objectively – an amazingly talented artist in the areas of composing, writing, singing, rapping, acting AND dancing. He puts his heart and soul into his career with a dedication that can be observed in few other stars. Whether it is making a video, writing a song or just simple social media fan-service, he always gives it his all. Admittedly, his image is quite the antithesis of that portrayed by other stars mentioned in this article, in that he is not afraid to get a little out-there, wear literally whatever he wants, do ridiculous things to his hair and ultimately, be free (as ‘free’ as a K-Pop star can be). But it is refreshing to see most of the ways in which he deals with his fame. Also, he’s so into his job that I’m fairly sure no fan out there is quite sure exactly what his personality is. One moment, he’s chillin’ at the dinner table not saying a word as his band-mates run the show of 2NE1 TV, nek minnit he’s in the studio being completely serious and then suddenly he’s all-out crazy and singing about crayons. I must say though, it is lovely to see his devotion to both his fans and the boys in his band Big Bang (well-reflected in his 10 year heart-warming friendship with fellow bandmate ‘Taeyang’, with whom he began his career at YG Entertainment). G-Dragon started singing at the ripe age of 5 and has come to produce sheer brilliance in both his solo and group career. Furthermore, having started his career at YG at 13 as a janitor and water-boy for older YG stars and now pretty much owning the world of K-Pop, he is an inspirational example of where hard work can get you. I like to think that even if he had not been scouted all those years ago by SM Entertainment whilst he was on a skiing trip with his family, he would have somehow found his way into the musical industry and received the credit he has long deserved. So there you have it: the best and worst decisions in K-Pop according to Krispy. It was a lot of fun writing for this blog and I hope that I will one day get invited back! If you’re curious, you can check out my K-Pop dance crew at www.youtube.com/ZISSpop.